Don’t confine your sportswear pieces. With some creative styling, you can integrate them into your everyday looks. Every other week, I’ve got you covered with new outfit ideas for the gym and Not Just for the Gym. I like to start my weekends off with an early workout. 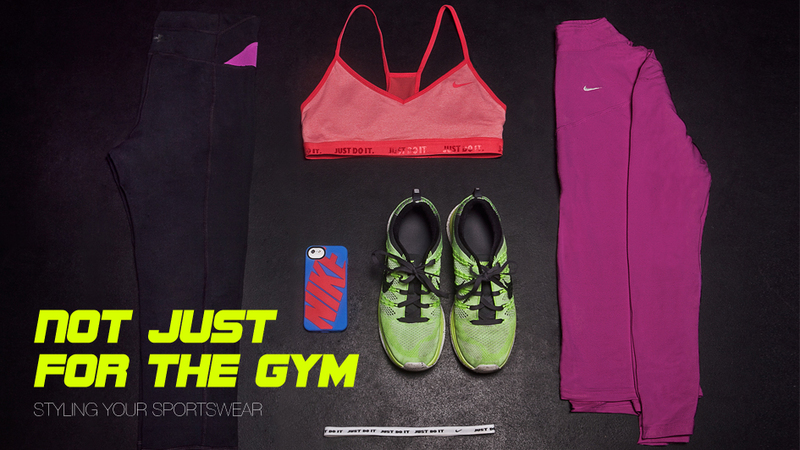 This is the most obvious place for performance wear, but don’t be afraid to play around with color and accessories. Look good, feel good. Resist the urge to wear sweats and a hoodie yet again. Throw that hoodie over a cotton t-shirt dress, and elevate the outfit with a pair of sneaker wedges for a look that’s comfortable and stylish. Stay loose at home with light fabrics that give you room to breathe while you cozy up on the couch with your boo–or yourself–and catch up on TV reruns. Some people go on party hiatus once the cold weather hits, but sometimes a casual night on the town with friends is much needed. Rock a crew neck sweatshirt over leather (real or faux) leggings and classic Timbs. Like these tips? Try them out, and share your photos with us using the hashtag #FNLStyle. Or, comment below with your own ideas! Anna Bediones is co-founder of CAVE magazine, has written for Complex, was a Nike visual merchandiser, and is a total sneaker fanatic. Check her out on Twitter and Instagram.